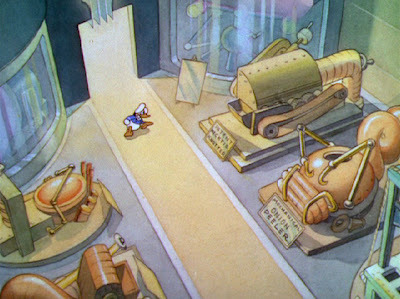 Disney's 1937 animated short film, "Modern Inventions," opens with Donald Duck entering a Museum of Modern Marvels. Emphasizing automation and robots, the short has a lot in common with the Fleischer Brother's, "All's Fair at the Fair," which we looked at earlier in the week. The museum is full of wonderfully ridiculous inventions from the future such as the pneumatic pencil sharpener, peanut sheller, robotic nurse maid, old razor blade mangler, robotic hitch-hiker's aid, potato peeler, the hydraulic potato peeler, mechanical bottle opener, and the automatic bundle wrapper. 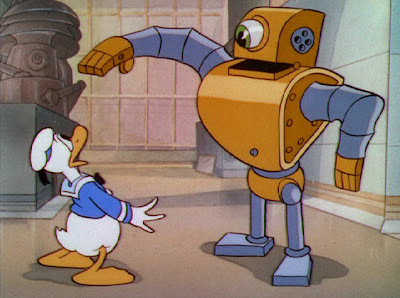 You can watch a clip of "Modern Inventions" here and you can find the short on the DVD set Walt Disney Treasures - The Chronological Donald, Volume 1 (1934-1941). The "Old Razor-Blade Mangler" sounds more like a serial killer than a modern marvel. Watch out, Donald! 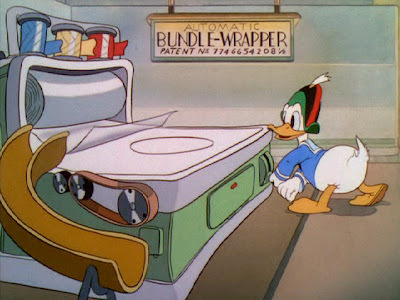 This is one of my favorite Donald Duck cartoons-- I love when he gets stuck in the baby stroller: "awwww, he's momma's little lamb-y"
I'm very curious, though, if any other Donald Duck fans can help me out with an odd question. On one of the cartoons in this set (where Donald is being frightened by a gorilla escaped from the zoo) he and his nephews listen to a radio newsman who gives them updates on how to capture the gorilla. He continually signs off: "That is all. Breckenridge." I remember this cartoon from the Disney channel from when I was little. It stuck with me because I thought it was creepy and scary! My favorite part of this cartoon was Donald's infinite supply of hats. He always had a new one to pull out when a machine destroyed the one he was wearing. I find it fascinating that the robot butler moves like a wind-up automaton. Now in the future we are used to seeing robots move with absolute precision.